You'll quickly become a pillar of the fashion community if you show up in these killer heels. 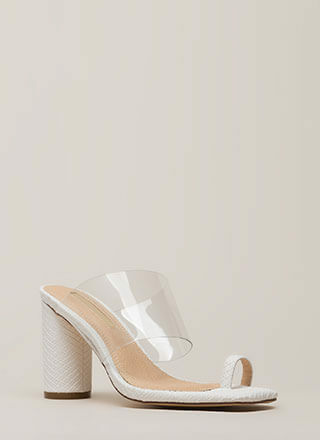 Open-toe satin platforms feature an open sandal design that includes a single toe strap, an extra skinny ankle strap with an adjustable buckle, and a tall, pillar-like chunky heel with a ridged, reflective surface for an art-deco-inspired look. Shoes are finished with exposed sides and a ridged sole.